After a short, but nonetheless difficult, spring the regular season for the women’s and men’s tennis teams has finally come to a close, with the imminent postseason rearing its ugly, yet tempting, head. Closing their regular season out with a dominant win-loss record of 11-2, the fifth-ranked women’s team fell in the semifinals of the NESCAC Championship to Middlebury, who is currently ranked fourth in the nation. The 12th-ranked men finished with a less distinguished win-loss record of 8-8 and also reached the semifinals of the NESCAC Championship, losing at the hands of—or perhaps, more accurately, the paws of—the Bowdoin Polar Bears. With their successive victories against 29th-ranked Trinity, sixth-ranked Tufts, and 27th-ranked Bates in their rearview mirror, the women carried their confidence through their 7-2 defeat of eighth-ranked Amherst on April 21. 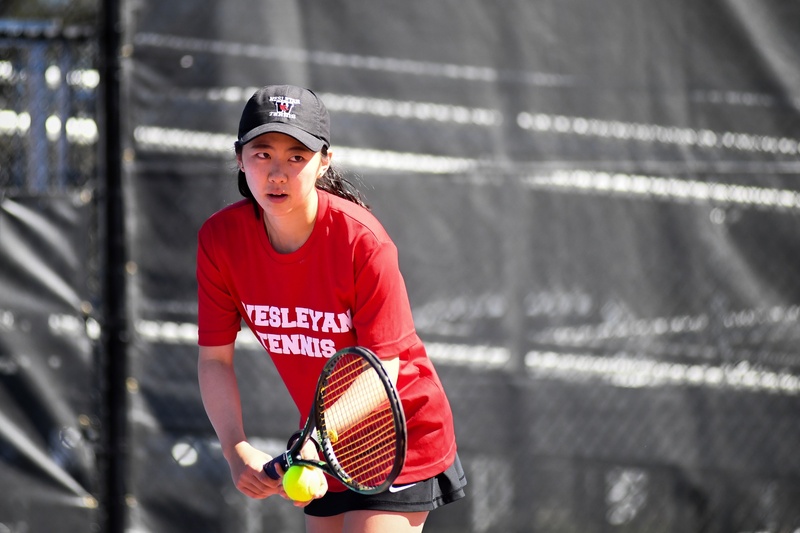 Exceptional victories included three-time NCAA Division III Singles Champion Eudice Chong ’18 and Victoria Yu’s ’19 8-0 conquest at one doubles; Aashli Budhiraja’s ’18 tight 4-6, 6-1, 10-8 triumph at three singles; and Polina Kiseleva’s ’21 pleasant 6-2, 6-4 win at four singles. However, the Cards encountered more difficulties in their following dual against fourth-ranked Middlebury, in which the Redbirds fell 6-3. Most of the matches were won comfortably. This included Chong’s best-in-bagel-baking 6-0, 6-0 at one singles and Yu’s 6-4, 6-2 success at two doubles, but also all six of Middlebury’s victories. Clearly, the Dirty Birds can find success, but team members on the lower half of the ladder appear to struggle against top-ranked opponents. But the Redbirds turned the other cheek and persevered, devastating unranked Conn College 8-1, with the Camels’ only point coming from a default. Some of the more savage victories came from Julia Kim ’20, who conquered three singles 6-1, 6-2; Helen Klass-Warch ’18, who dominated four singles 6-2, 6-1; and Zoe Klass-Warch ’21, who was slightly more generous with a 6-3, 6-1 triumph. The final regular season match for the Cardinals, which also doubled as Senior Day, came against unranked Colby, whom the Cards obliterated 9-0. Seniors H. Klass-Warch and Nicole McCann won a tight two doubles 8-6; Budhiraja opened her own bakery with a 6-0, 6-0 victory at three singles; H. Klass-Warch did the same with a 6-1, 6-1 triumph at five singles; and Z. Klass-Warch succumbed to the peer pressure with her own 6-0, 6-0 victory at six singles. The Redbirds’ postseason began with a 5-2 victory over 14th-ranked Bowdoin in the quarterfinals of the NESCAC Championship. Important wins for the team came at two doubles, with Kiseleva and Alissa Nakamoto’s ’21 8-3 success; Budhiraja’s 6-2, 6-4 success at three singles; and Nakamoto’s comfortable 6-3, 6-2 conquest at five singles. Yet the semifinals of the Championship felt like déjà vu for the Cardinals. Once again facing Middlebury, the Dirty Birds fell 5-3, with the only victories coming from Chong and Yu, first an 8-3 win at one doubles; a 6-3, 6-3 victory at one singles from Chong; and finally a 6-3, 6-1 win at two singles. Unfortunately, the Cardinals’ lower order failed to maintain the success their top players garnered. Compared to the women, the men’s team has had more of a mixed bag in the latter half of their regular season. Following their 9-0 trouncing of 24th-ranked Bates, the Cardinals fell 5-4 in a tight match versus seventh-ranked Amherst. Clutch victories came from Princeton Carter ’20 and Tiago Eusebio ’18 at one doubles, who won 8-6; Steven Chen ’18, weathered a three-set storm at one singles to come out on top 7-5, 5-7, 6-2; and Andrew Finkelman ’21, who maintained a comfortable 6-4, 6-2 vanquishing of two doubles. The next match for the Cardinals was equally devastating, again losing 5-4, this time to sixth-ranked Middlebury. Top wins for Redbirds’ came at three doubles with a 9-8 (2) victory from Chen and Cam Daniels ’18; a magnificent 6-3, 5-7, 11-9 triumph at one singles from Chen over last year’s NCAA Division III Singles Champion Lubomir Cuba; and an equally close victory from Finkelman, who overcame 2015 NCAA Division III Singles Champion Noah Farrell 1-6, 6-1, 10-8. Redemption for the string of losses came in the form of a 9-0 victory versus unranked Conn College. Exceptionally dominant performances came from an 8-3 win by Joachim Samson ’19 and Zach Fleischman ’21 at three doubles; Finkelman with a 6-0, 6-4 success at one singles; and Fleischman with a 6-0, 6-1 trouncing at four singles. Senior day was a sordid affair for unranked Colby, whom the Dirty Birds subdued 7-2. Adrian Roji ’21 and Win Smith ’19 pulled out a crucial 8-4 victory at two doubles, followed by a marathon 6-2, 6-7 (0), 10-5 conquest by Chen at one singles and an easy 6-1, 6-1 win for Jonathan Holtzman at six singles. In the final dual of the regular season, the Cardinals faced one of their toughest challenges: third-ranked Bowdoin, whom they fell to 8-1. The Redbirds’ sole victory came in the form of an 8-0 win by Chen and Daniels at three doubles. Unfortunately, the Cards suffered defeat in all other matches, although three of the singles matches went to either a third set or super-tiebreaker. First on the chopping block for the Cards at the NESCAC Championships was Amherst, now ranked eighth. Looking for redemption, the Dirty Birds pulled off a nail-biting 5-3 triumph over the Mammoths. Crucial in the Cards victory was their three victories in doubles, in addition to Carter’s 6-2, 6-0 rout at six singles and Daniels’ dual-winning 3-6, 7-5, 6-4 triumph at four singles. Unfortunately, the Cardinals season came to a quick and decisive close in a 5-1 loss to Bowdoin. The Redbirds only victory came from Chen and Daniels, who closed out a tight match at two doubles 9-7. Yesterday at noon, the NCAA awarded an at-large bid for the NCAA DIII Team Championships to the women’s team. The Dirty Birds will be playing the winner of Hope College and John Carroll University on May 11, but if everything goes according to plan, their first proper competition will be versus Middlebury in the quarterfinals. Unfortunately, despite their final ranking of 12 in the nation, the men’s team failed to receive an at-large bid, and so their season ended with their loss to Bowdoin. Selections for the individual NCAA DIII championships will be announced on Wednesday, May 9. Nothing is certain until the announcement, but Chong and Yu will likely be selected. On the men’s side, Chen and Finkelman appear to be frontrunners for selection from the Cards. Finally, the Cardinals will be saying goodbye to seniors Budhiraja, Chong, H. Klass-Warch, and McCann on the women’s team, and Chen, Daniels, and Eusebio on the men’s team. Sports always have to work hard, but when the cup is held, it is really great !! !